Baby products retailer has one store in Singapore, located within City Square Mall (180 Kitchener Road). 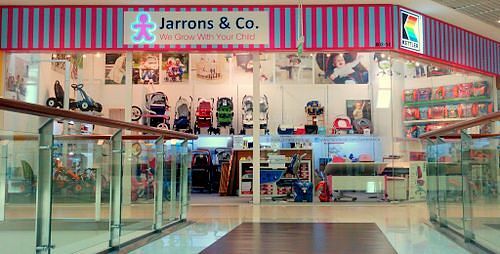 Jarrons & Co. is a Singapore-based children’s merchandise retailer that focuses on designing, contract manufacturing, and procuring high-quality and valued products for Singapore’s precious little ones. The main categories of Jarrons & Co. products are baby cots, car seats, diapers & clothing, strollers, trikes & ride-ons, kids ergonomics, nursery products, baby gear, baby care products, products for feeding, play & learn products, as well as maternity products. For kids ergonomics, you can purchase desks, chairs, desks & chair bundles, schoolbags, stationery, and accessories. The stroller range features single strollers, convertible strollers, plus stroller accessories. If you’re looking for baby cots, Jarrons & Co. carries cots & cribs, mattresses, as well as beddings. For nursery, meanwhile, there are baby baths, under cot drawers, diaper changing boards, bouncers & rockers, musical mobiles, and night lights. The diapers & clothing category has cloth diapers, training pants, swim diapers, diaper inserts, wet bags, laundry bags, plus baby towels. Maternity products range features nursing & feeding pillows, bottoms, nursing bras, and nursing pads. Play & Learn category is one of the biggest and most popular ones at Jarrons & Co. and offers soft toys, baby toys, toys, pretend play products, art & craft products, classic toys, educational toys, trains & vehicles, puzzles, ride ons, figurines, science toys, mathematics toys, and constructional toys. The official Jarrons & Co. Facebook page is located at www.facebook.com/JarronsnCo. Following the Facebook page, you’ll receive updates about the company’s new products, promotional offers, events, and more.